Choose your Hair Analysis Lab Carefully! Does the lab specialize in hair analysis only? Does the lab “wash” the hair prior to the analysis? Does the lab provide computer-generated dietary/supplement recommendations? Is the lab a trusted industry leader and serve healthcare professionals worldwide? Numerous labs perform hair analysis but very few “specialize” in hair analysis only. As you know, a specialist usually possesses a deeper understanding and level of expertise in their specific field. Our lab, Trace Elements Inc., not only specializes in hair analysis but the Founder and Director of Research Dr. David L. Watts is one of the original pioneers (associate of the late Dr. Paul Eck, Analytical Research Labs) in the “clinical application” of hair analysis. First, for the past 38-plus years, Dr. Watts’ career has remained in the field of nutritional research and the clinical application of Hair Tissue Mineral Analysis (HTMA). For the past 33 years, Dr. Watts has had the means through his own laboratory, Trace Elements Inc., to continually apply and quantify the most current nutritional sciences. This is imperative for the proper “interpretation” of the laboratory results (as seen in our Trace Elements Inc., Profile 2 Hair Analysis). Interpretations include inferred or potential metabolic disorders based on nutrient patterns and relationships. Interpretations also include food and supplement recommendations as well. In addition, Trace Elements Inc. is continually involved with governmental agencies to continually monitor and improve laboratory procedures. We do have an obvious advantage, and that is that we specialize exclusively in mineral analysis, unlike other labs, which perform a multitude of other tests. By concentrating on one analysis, we are able too continually refine the technique. ~ Dr. David L. Watts, Founder, Director of Research Trace Elements Inc. Trace Elements Inc. uses state-of-the-art laboratory equipment and remains on the cutting-edge of technological advancements for laboratory equipment. As with all technological advancements throughout society, elemental (minerals) analysis has surpassed the parts-per-million (atomic spectroscopy) into the parts-per-billion (plasma spectroscopy)! However, all laboratory equipment from the clean rooms to the sample preparation equipment to the analytical equipment and computer databases for proper interpretations of applied science must remain state-of-the-art to provide you the most accurate results. Laboratory procedures and a highly trained staff are as important as the technology the lab uses. Apart from the harvesting of the hair sample, maintaining strict laboratory procedures and protocols (as per the National Institute of Standards and Technology, National Bureau of Standards, licensures, etc.) are the most important steps for producing the most accurate and reproducible results. Trace Elements Inc. and Analytical Research labs do not “wash” the hair. Even though washing the hair prior to an analysis has shown to skew the results by removing exogenous elements, most other laboratories continue to “wash” the hair. Washing the hair has shown the potential to interfere with the accuracy and reproducibility of the results. Accuracy and reproducibility are important standards for all laboratories. This has led to differences between analytical results between labs that have contributed toward the criticism of hair analysis. Hair dyes and treatments – at HairAnalysisReport.com (and Trace Elements Inc.), we do not accept permanently altered hair samples. Simply put, most of these treatments will alter the elemental content of the hair and as such, potentially result in an analysis that is not accurately reflecting your mineral blueprint. Here again, it does not make sense to provide you with an inaccurate analytical result. Simply wait (4 to 6 weeks) until there is sufficient “virgin” (untreated) hair to collect the hair sample. 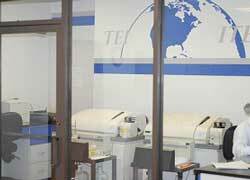 Learn more about Trace Elements Inc. laboratory quality control and quality assurance. At first glance, this may not seem important. However, these are important components of any nutritional or detox program. As seen throughout this site, nutrient interrelationships are extremely complex. Our hair analysis lab not only performs the analysis but equally important, our Profile 2 and Profile 3 (re-tests) provide a computer-generated list of foods to avoid and increase. These recommendations are derived solely from the results of your analysis and will greatly assist your nutritional and metabolic goals. Food recommendations result from a large computer database containing nutrient information of a wide variety of foods. The nutrient information in this database includes minerals as well as vitamins, amino acids and fats because vitamins, amino acids, and fats are required to rebalance your minerals. Keep in mind, nutrients do not work by themselves and require myriad other nutrients (cofactors) to complete their purpose. In addition, our hair analysis lab report also provides specific supplement recommendations. Trace Nutrients®, specifically formulated by Dr. Watts, increase the effectiveness of the food recommendations. Trace Nutrients® are formulated by recognizing and maintaining intimate nutrient interrelationships that complement your food recommendations that evoke metabolic changes. Simply put, these recommendations help remove nutritional guesswork! NOTE: Both food and supplement recommendations are based exclusively on the results of your analysis. As such, these recommendations are specific only to you. We know, as hair analysis providers, you would prefer to work with the best hair analysis lab possible! Since 1984, Trace Elements has been recognized internationally as a leading provider of HTMA laboratory services and nutritional metabolic products for doctors and health professionals of all specialties worldwide. Trace Elements serves health professionals exclusively in over 46 countries. Are you ready to work with the best hair analysis lab? Click here to order your hair analysis today! What is Hair Analysis: A drug test, DNA test, or Hair Tissue Mineral Analysis? Hair Analysis History: Hair analysis has been around longer than you may realize. Hair Analysis Controversy: Why is there so much controversy? Hair Analysis Sample Collection: Follow this simple protocol for an accurate analysis. Hair Analysis Provider: 7 important questions you should ask your provider. Hair Analysis Consultations: Make certain you understand your hair analysis results. Trace Elements Inc. Profile 2 Sample Report: View the comprehensive information provided in your report (PDF file).